An interview on the political and social situation in Chile following the great student mobilization of 2011, conducted by Giulia Willig for the Swiss journal solidaritéS. Giulia Willig: Where is the Chilean student movement at today? Franck Gaudichaud: Historically, the movement of students in tertiary and secondary education has always been a very significant social actor in Chile, including under the dictatorship. Under “neo-liberal” democracy, there has been a recomposition of student struggles, culminating in 2011 with a mass mobilization around the demands for free and high quality public education. Today, the movement is again in a very active struggle, with occupations of high schools and universities, after having for a while encountered a little difficulty in facing the new political scenario with the election of President Bachelet, who conceded in part some of the major demands, for example on educational reform, but by integrating a social-liberal perspective which does not break with the neo-liberal democracy constructed in the 1990s. After the struggles of 2011-2012, which were huge and radical, and shook the whole political system, the last year has been a period of adjustment, since the CONFECH (Confederation of Student Unions) has had to face a scenario in which the government proposed reforms “from above.” The leadership of the student movement in part fell into the trap of the “dialogue” offered by the Ministry of Education. On the other hand, some leaders of the 2011 student movement, like Camila Vallejo (CP) for example, are in parliament and/or in the coalition government. This year, we see that the student unions have resumed a dynamic of struggle with clearer orientations, and since May there have been massive demonstrations of more than one hundred thousand people. Another interesting element is that since some of leaders in 2011 have been integrated in the parliament and/or the executive, it is the political forces to the left of the Communist Party which dominate the CONFECH, thus they are independent of the coalition government. Among them, the Autonomous Left (Izquierda autonoma), the Front of Libertarian Students (FEL), the Student National Union (UNE) or even small revolutionary organizations. It is therefore the left of the left which has weight within the CONFECH, which could mean a year of more direct clashes with Bachelet and her reforms. That said, there are limits to this apparent “radicalism”: in political terms first, but also in terms of representativeness since the rate of abstention at student elections is very high, around 60%. Sergio Grez: the Chilean student movement for free high quality public education for all has, like all social movements, known advances and setbacks. After 2011, it went through a certain reflux, due to the results of the mobilizations of that year. It had the sensation of having obtained nothing as a concrete result. However, the movement continued forcefully enough in 2012. The year 2013 was calm, in good part because it was an election year, which is generally not conducive to social movements. Then in 2014, Bachelet came to power for the second time with, it must be emphasized, only 25% of potential votes, since the rate of abstention reached 60%. The new coalition in power, the former “Concertación” renamed as “New majority” (“Nueva Mayoria”) which the Communist Party (CP) is part of, took up, somewhat dishonestly, some of the slogans of the student movement, which nourished hopes within the social movement, especially since the integration of the CP. If Bachelet’s election, and Eyzaguirre’s appointment to education, no doubt gave a breath to the student movement, they were caught in the trap of a dialogue of the deaf. This does not mean that there were no mobilizations, but they were few and relatively weak. The student movement won almost nothing in 2014, apart from derogation to a decree which made the organization of students more difficult. 2015 looks better: several large demonstrations have already taken place since of April, demonstrations which were joined by other citizens, taking advantage of this situation to demonstrate their fundamental disagreement with the policy of the government. On 21 May, 2015 Bachelet made a presidential speech before Congress in Valparaiso, while a massive mobilization was taking place in the streets, which was violently suppressed. A young girl was seriously injured, while another protester is today still in a coma. This is reminiscent of the police repression of the right wing government of Piñera, but also that of the first Bachelet government against the movement of “penguins” in 2011 (a movement of secondary school students). So the student movement is beginning to awake, several faculties are on strike and mobilizations are unfolding. I think that the student movement is going to set the tone this year, inasmuch as it rejects the educational reform proposed by the government. It rejects the government view that free education is obtained through scholarships. It demands free education as a social right guaranteed as universal by the state and enshrined in the Constitution. The mobilization of students is therefore intrinsically linked to the demand for a change of Constitution. Today, the demands of the student movement are broader than those relating to education. FG: there is not really a break between 2011 and today: the students continue to demand a free high quality public education, which also amounts to questioning the Bachelet reform which does not challenge the educational market, but only introduces free education for students (initially for 70% of them) by subsidizing it still more. The current demands also deepen what has been tried in 2011: to link their specific demands to the whole of society, by defending for example the nationalization of natural resources and of copper, or again a redistributive tax reform, far from the one advocated by Bachelet, which spares most of the big bosses. It is for this reason that they call for a unification of social and popular struggles. There is an as yet timid attempt in this direction within the Platform for Education (“Mesa por la educación”), in order to try to obtain the support of the workers or of the “pobladores” (the movement of the urban poor). It is important to see also the presence of lecturers and their demands in the demonstrations. This is an interesting process, even if we see that it is still difficult to set up. It must be remembered that we are in a context where the CUT, the main trade union federation, is dominated by the Christian Democracy (DC) and the CP, like the leadership of the College of Teachers, who have no interest in creating difficulties for “their” government. The weaknesses or the dispersion of the trade union movement are reflected also in the possibilities of creating a broader, “class-based” arc of forces. Nevertheless, there are in the trade union movement “class struggle” sectors which are developing, including recently in the port unions, which clearly call for a dynamising of labor-capital conflicts, while supporting a change in the model of education, calls for the nationalization of natural resources, the end of pensions dominated by pension funds, the right to self-determination of the Mapuche people and so on. The demand which could partly federate all of these sectors is the demand for a constituent assembly, popular and democratic, but the road is still long. SG: Since 2011, the student movement has managed to highlight the theme of education, which is already a great step forward. 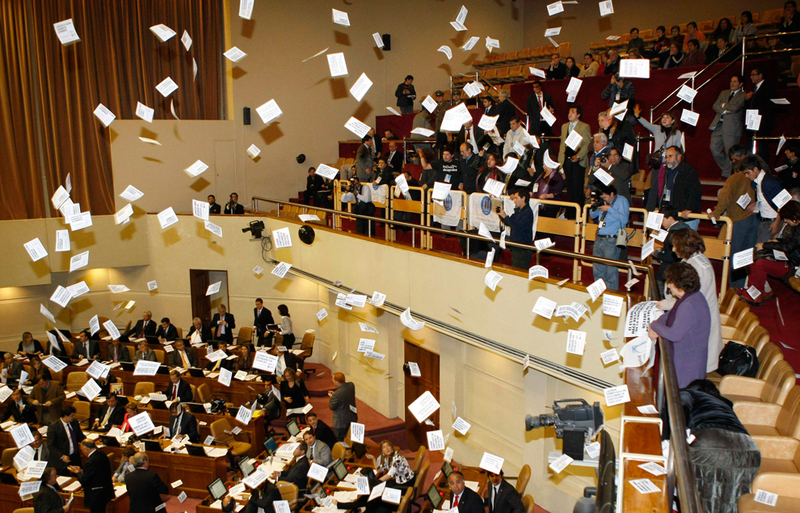 Until the beginning of 2011, nobody in Chile dared treat education as a key political topic. Thanks to the mobilization, in a few months, this situation changed dramatically. Today, the whole world, from far left to far right, agrees that it is a fundamental theme. At the same time, the student movement has managed to bring to the fore other questions about the issue of financing education. They have advanced very concrete proposals developed in a responsible manner, in particular the draft tax reform and the nationalization of copper. Some sectors are now demanding a constituent assembly. That said, from a practical point of view, it must be recognized that since 2011 there has been no notable advances in the construction of links between social movements. There have been attempts by the student movement to go to other social movements, for example the Mapuches, the movement of teachers, of course, and sometimes some struggles of workers, for example in the ports. But in my opinion, these relations are still weak, there are no stable, organic and permanent bonds between these social movements: it is something which must be further developed. What are the other social movements? SG: Among the most significant movements currently, there is first the Mapuche, which is not strictly social since it contains a national political demand, for autonomy and the reconquest of certain rights which have been denied, in particular the right to land and political rights. There is also a fairly strong movement against the centralism of the state. The movement of workers in the ports is very interesting. In Chile, the sea has been privatized; it belongs to seven major economic groups, while only small portions of the coastline have been left to artisanal fishers. The movement has organized for a few years around the port unions, which do not have legal status but involve unions who do. They conducted very significant strikes and mobilizations in 2014. It is a remarkable movement, because from a political point of view, it is able to threaten the interests of the large exporters (fruit, wood). But also because it was able to mobilize the workers all along the coast, in solidarity with workers in the port of Mejillones, who asked to have an hour for their lunch instead of the current 30 minutes. Almost all the workers in the ports mobilized to support them. It is a movement that has revived the traditions of solidarity among workers, broken by the dictatorship, and in general by the neo-liberal model of current democracy. What is the current state of the forces of the radical left? FG: first of all, it must be said that the current state – as yet fragile - of class struggles is a first limit to the recovery of the political forces of the anti-capitalist left, which remain very scattered and divided. In this context, it is difficult to envisage a “cold” unification of the radical or revolutionary lefts, whose contours remain to be defined. For example, if we talk about the student movement, there have been attempts, like the “Bloc de conducción” which brought together the Autonomous Left (“Izquierda Autonoma”), the Student National Union (UNE) and the Front of Libertarian Students (FEL). Together, they had a relative hegemony on the leadership of the student movement. But this front – you might call it “broad anti neo-liberal”- broke up a few months ago, lacking internal coherence. More generally, unification is also difficult between many small groups or revolutionary collectives, from various political cultures which have an often limited influence on this or that sector. These forces are still very much in the minority, but some have grown since 2011, boosted by the renewal of the social struggles. The question is how to develop, today in Chile, an anti-capitalist and pro-self management left, not dogmatic or sectarian or electioneering or opportunistic, able to debate a political program of clear rupture, of transition, but also helping in the short term to develop the unitary action, on the social and political front, which is useful for strengthening popular movements. Crucial strategic issues are controversial: how to face up to the new political cycle marked by the “transformism” of the Bachelet government, in an anti-capitalist perspective? But also, who are the “subjects” of the social transformation for which we are fighting in Chile currently? What place for the party form? The radical or revolutionary Chilean lefts have sometimes found it hard to integrate topics such as ecology or eco-socialism, feminism, or to carry out a concrete internationalist work, which hampers its strategic development. If you want to summarize in broad brush strokes, the landscape of these left political forces is still very fragmented, there are organizations which come from what may be called the “new mirismo” (from the name of the MIR, the main revolutionary organization of the Allende era) and which stretch from anti-neoliberals to Guevarist forces; a very broad libertarian current, ranging from “pure” anarchists to libertarian activists advocating a “democratic rupture” including electoral work; there are also all the forces that come from various splits within the Communist movement and “Rodriguismo” (from the name of the Frente Patriotico Manuel Rodriguez); and finally a Trotskyist current, derived more or less from “Morenismo” with some presence. SG: there is, in my opinion, excessive fragmentation. In Chile, we have a left which is more social than political. Of course, behind the social left, there are more or less broad political formations, but they are very scattered and do not have the ability to agree, even where there are convergences of substance on a good number of issues. The elections of 2013 are a good example of this: there were four “left” or progressive presidential nominations out of a total of nine, all defended the Constituent Assembly, but they were not able to unite. Each group pushed forward its own interests. The radical left is not capable of looking at things with a little more height, foresight and generosity. What analysis can be made of the Bachelet government? FG: the government of President Bachelet is a social liberal coalition government which goes from the center-right (with the Christian Democrats) to the CP and which is part of the framework of the neo-liberal semi-authoritarian capitalist model installed at the end of the dictatorship. I have spoken in this respect of a “social liberal transformism.” 1 In a way, the executive responds to the struggles and to 2011 by attempting to stabilize this model by partial reforms. This is a point of direct controversy with the analyses of the CP. Today, the government must face a legitimacy crisis unprecedented since 1990, with repeated huge cases of corruption which have affected the entire political world in the last few months. This has revealed the level of integration between the big companies, capital and the whole of the political élite. All have received money from the major groups like Penta, Soquimich, privatized enterprises or created during the dictatorship. However, the response of Bachelet has essentially consisted of a change of cabinet, giving it an even more conservative tilt than before: we have witnessed the return of the old cadres of the Concertación (a centrist coalition born at the end of the dictatorship, the ancestor of the current “Nueva Mayoria-cambio”) to key positions of government power. Many sociologists have considered the government of Bachelet as a sign of an opening, a certain renewal. If a new political cycle has been generated – from below - by the social struggles, there is continuity at the top. Moreover, the employers and the “Mercurio” (the main daily newspaper, rightist and a former supporter of Pinochet) are not fooled; they incessantly praise the Prime Minister, as well as the Minister for the Economy and the Minister of the Interior. This explains why Bachelet made almost no announcement in her presidential speech on last May 21st. Everyone has noted that she did not mention a constituent assembly, which confirms what we already knew, namely that there will indeed be a “new Constitution” which will still be the one introduced by Pinochet in 1981, but without a Constituent Assembly. There will probably be “citizen consultations,” but the bulk of the work will be done in the closed cabinet of the parliament, before being eventually subjected to a plebiscite. For the rest, the worst points are confirmed, on labor reform for example, which has been denounced, including now partly by the CUT. In the field of education, the goal is to reach 60% of free education by 2018, but still in the context of the market. Therefore, it is the state which will subsidize this private service which, initially, will exclude students from private universities, which is problematic since that is where paradoxically we find the most students, and often the poorest. SG: That is a reformist government which is intended to correct certain aspects of the neoliberal system to give it a broader and more stable social and political base. If we analyze each of the reforms, whether in education, taxation, employment, the pension system or health, they are about small changes which do not seek to break fundamentally with the current model. Of course, there has been an increase in social spending since the end of the dictatorship, but this expenditure often finally benefits the capitalists. In the case of education, for example, the government proposes to increase scholarships, with which the students can then make their choice on the education market. This is to subsidize demand. Today, the state provides only 10-15% of their needs to public universities, whereas under Allende, the public share amounted to 80%! It is the same thing for health: as the public hospitals cannot meet all needs, we give subsidies to patients to seek treatment in private clinics. Finally, it increases the profits of the private institutions and weakens the public sector. That is the neo-liberal model, and in that sense, the government of Bachelet does not differ from the right. Concerning the pension system inherited from the dictatorship, this is not a social security system, but private insurance based on individual capitalization. There is no solidarity-based redistribution. However, what Bachelet proposes is that the state frames this system in order to guarantee better services! But it will change nothing on the ground. On the contrary, we should give the money to the workers, and create a pension system by distribution, just and inclusive. The right has also understood that it has not much to fear from the Bachelet government. Its representatives were opposed to certain things, but in the background, they support the policy it pursues. In reality, the classic right is undergoing a deep crisis, not only because of repeated corruption scandals, but also and especially because the “Nueva Mayoria-cambio” is stealing its role of representation of the ruling classes. Franck, what is the position of the Communist Party, integrated into the government, but continuing to have a strong presence in social movements? FG: Its position is fairly complex. It is the most disciplined party in the government coalition, which applies the decisions and supports Bachelet whatever happens, more clearly than the DC or the Socialist Party (PS), who have publicly expressed their criticism. Moreover, the CP has been rewarded for that in the new cabinet, because it got two ministries. Yet, there is no organized dissent - which the party does not tolerate - but muted criticism at the rank and file level, including the communal frameworks, of the neo-liberal orientation of the coalition. For example, on the labor reform, considered very problematic, or on the constituent assembly, whose convening is postponed to the distant future, and so on. Figures like Camila Vallejo, who had a certain degree of autonomy in speech, approved the presidential speech without batting an eyelash, except the regret that there is no constituent assembly. The CP’s gamble is to continue this return to the government, with the idea that the ongoing reforms are a first step. Hence the substantive debate: is this a first step toward an initial democratization of neo-liberalism, as the CP maintains, or on the contrary an attempt to stabilize the system inherited from Pinochet threatened by the recomposition of the social struggles, as the radical left sees it? Finally, the bureaucratic integration of the CP is very important, since it holds numerous senior management positions in the state apparatus, but also the vice-presidency of the National Assembly. In addition, it benefits, including financially, from its participation in power, which has consolidated it as an institutional party. Therefore, any rupture would be all the more difficult. On the other hand, the CP is still an actor in the social movement, with a real capacity for organization in some popular sectors. The Communist Youth have a strong presence in the student and secondary school student movement; a part of the trade union movement is under the influence of Communist leaders (the copper mining sector for example), the party holds the presidency of the CUT and the College of Teachers. In fact, they say that the CP is the main social force of the government, the only one capable of attempting to channel the popular movement. That does not prevent it from calling mobilizations, but they are in favor of the government and its reforms. The repression of mobilizations, particularly of students, appears to be accentuating lately. Two young people in particular were brutally attacked by the security forces during a demonstration. FG: The climate is getting tenser, repressive practices are proliferating. This did not begin with Bachelet of course; this is a recurring historical problem and a state practice. But with regard to the recent violence against students, with one young activist still between life and death, there is a direct responsibility of the government, the police and the Minister of the interior. This is also the case in the south of the country against the Mapuches. In this regard, recently an undercover police officer was recognized before a court as having carried out arson, in the framework of activities dictated by the secret services. A young Mapuche, wrongly accused, has spent 11 months in prison, and that is only the tip of the iceberg: the practices of police infiltration, provocation and violent repression are almost daily in the entire space of the social struggles and constitute again a heavy authoritarian legacy renewed by the civilian government. SG: The government, whatever it may be, that of Piñera or Bachelet, plays the game of the carrot and the stick. On one side it punishes, and on the other, it launches appeals for dialogue. The present government is a specialist in “platforms for dialogue” on many subjects. Its strategy is to talk at length, without actually leading to concrete things. And sometimes it gives small concessions, especially now, with the student movement, where it has in any case a fifth column formed by Communist activists. This did not exist at the time of Piñera, when the CP was clearly part of the opposition. Camila Vallejo, former leader of the student movement, today Communist deputy, has clearly said: “we will have one foot in the street, the other in the government.” However, we see some of the contradictions today: you cannot at the same time be on the side of the students and the government which represses them. Who is the Minister of the Interior that Bachelet has just appointed in her new cabinet? It is Burgos, a Christian Democrat, who was one of the heads of the “Oficina” in 1990. This was the secret service created by the Concertación to dismantle the left opposition which had taken up arms during the dictatorship, and which had refused to give them up at the time of the transition, not trusting the new democracy. These groups were infiltrated by their former comrades, notably under the orders of Burgos. What more can be said on the reform of the Constitution? SG: Chile has already initiated a constituent process, but the stakes are currently focused on how to conduct this reform. There are two ways to do so: to elaborate a constitution through a commission appointed by the government, to have it approved by parliament, and finally to vote, en bloc, in a popular plebiscite. The other way is to elect a constituent assembly. It would be a free and sovereign body, whose work would be limited in time, and which would represent the people much more democratically. According to recent surveys of opinion, 60% of Chileans would be favorable to such a process. The problem is that today there is no legal institutional framework which would make it possible to establish a constituent assembly. So a subterfuge is needed, and that can only be done with strong social and political pressure from below. Since 2011, the slogan in favor of a Constituent Assembly has met with a growing support in the population. Currently, we are organizing a “school of constituents,” which is designed to train cadres to explain this idea to people, to show that it is the place where their interests could be defended. We are also thinking about the means to conduct such a process. The idea would be for example to introduce a quorum of two-thirds to vote through a constitutional change, and if this quorum is not reached, to proceed to votes on specific subjects, instead of taking a decision only on a final package. This would ensure a genuine democratic participation the widest possible, according to the old slogan of the time of Popular Unity: “crear poder popular” (“create popular power”). –This co-published interview was translated by International Viewpoint. 1. ↑ Franck Gaudichaud, “Las figuras del neoliberalismo maduro chileno: Trabajo, ‘Democracia protegida,’ y conflictos de clases,” CLASCO, April 2015. Franck Gaudichaud is a lecturer in Latin American Civilization at the University of Grenoble and a visiting researcher at the University of Chile. Sergio Grez is a professor of history at the University of Chile, Santiago.